Started in 2012, Wrangler’s True Wanderer has evolved into a community of like-minded bikers who share a common love for adventure and exploration. It continues to be an increasingly popular annual event for riders across the country to celebrate their love for the open road. True Wanderer Season 5.0 contest, organized by Wrangler in 2016, was bigger, better and bolder than ever before. 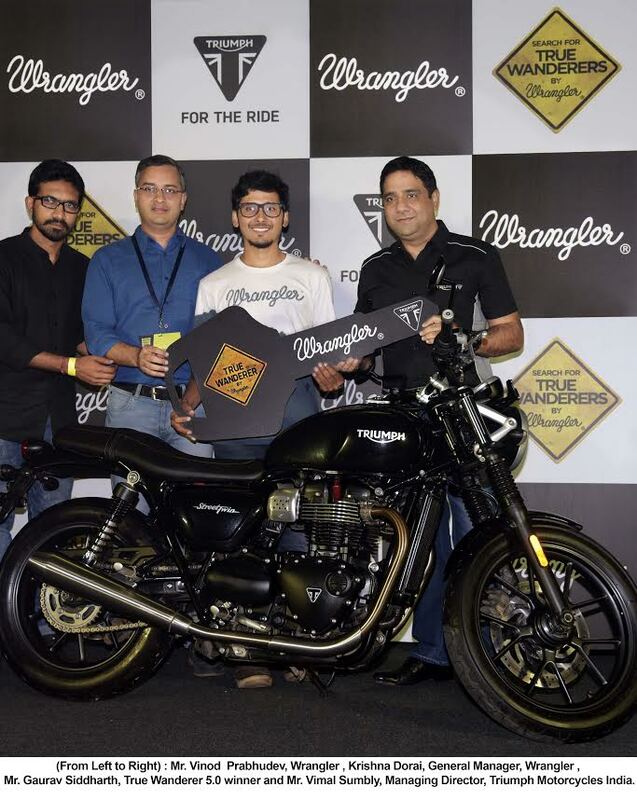 Thousands applied to be a part of the journey and 10 lucky finalists were selected to go on the ride of a lifetime and were flagged off from Wrangler stores across 9 cities. The 10 riders were styled in Wrangler’s range of Sun Shield and Silver Shield apparel. Wrangler announces the True Wanderer 2016 winner: Gaurav Siddharth from Lucknow! Gaurav’s winning True Wanderer ride was an adventurous journey on his Impulse bike from Lucknow to Korba (Chhattisgarh). Gaurav was styled in Wrangler’s range of Sun Shield apparel and Silver Shield jeans that gave him comfort, protection and long lasting freshness during his ride. On his 7day road trip, Mr.Gaurav Siddharth certainly had a lot of interesting stories to tell through his experiences, blogs and amazing pictures updated on https://wrangler-ap.com/in/, hence making him the perfect True Wanderer. Gaurav will ride home with a Triumph Street Twin Motorcycle and the title of True Wanderer 2016. The first runner-up is Shreyansh Latthe from Gangtok and the second runner-up is Vishnu Goyal from Pune. To know more, log on to https://wrangler-ap.com/in/ or on Wrangler Facebook page www.facebook.com/wranglerdenims.